Ah, how I have so longed to visit Seattle. I spent a whole lot of time out near it this year but it wasn't until last week that I was actually able to romp around the city. Given its overwhelming espresso and coffee reputation, grabbing the late morning java topped the list on things to do first. As the first coffee stop, I thought it appropriate to visit Espresso Vivace' at their Roasteria location as they have a grand reputation across the world for their love and detail for espresso. Sure enough, we arrive (with convenient street parking nearby) to find a line clear out the door, into the lobby, out onto their front ramp. My compadre and I stood in line for around twenty minutes, which according to their wifi policy (none until after 6pm due to high customer volume) seems to be normal. The menu consisted of the usual, except coffee. They serve only espresso (go with what you're good at?) as well as pastries and tea of course. The espresso, as expected, was expertly delivered and their blend (roasted in-house) sampled beautifully. As we were in a rush, we didn't get to sample the tea. 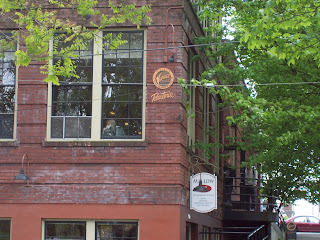 As a place which has garnered much admiration in the espresso world, I highly recommend making a stop at one of the numerous Vivace locations in Seattle. No matter the weather, it should brighten your day.